I remember when I was about 11 years-old - it was September, a brand new term at school. Sharpened pencils, a new shiny pencil case and maybe even a pristine set of new colouring pencils, too good to be removed from their box. A friend had returned from a Summer holiday adventure and was neatly arranging her keepsakes from her trip in a scrapbook. Photographs, tickets, notes, all mixed with pretty pastel coloured card and intricate designs printed on delicate paper. I was mesmerised and watched wide-eyed as she glued, coloured and weaved together her findings in a book bound together with ribbon. The truth is for a long time, and particularly at school, art was never my thing. Painting and drawing I loved but I was simply not good enough (or encouraged) to take art as a subject at GCSE. It's only now, in my thirties, that I'm exploring new crafts and having fun trying new skills. There's no pressure to pass exams, just to learn and have fun. I came across Project Craft at Paperchase by chance when looking for a new diary on their website. I discovered the flagship store in London's Tottenham Court Road offers a range of craft classes, just a few hours long and enough to dip your toe in to see if you warm to it. I chose the Scrapbooking class for a very reasonable £20 (including all supplies). There's also Card Making, Creative Journaling, Origami Flowers, Paper Cactus making and more. Cameron, a friendly and enthusiastic art student (who also works part-time at Paperchase) was my teacher for the afternoon and encouraged me to choose a theme for my scrapbook - I chose travel. I had brought along pictures, tickets and cuttings from a previous (poor) scrapbooking attempt and he helped me weave all the materials together into a double-page spread using coloured card, designer paper, washi tape and coloured string (for the bunting). He also showed me how to create pockets to store tickets and small mementos. 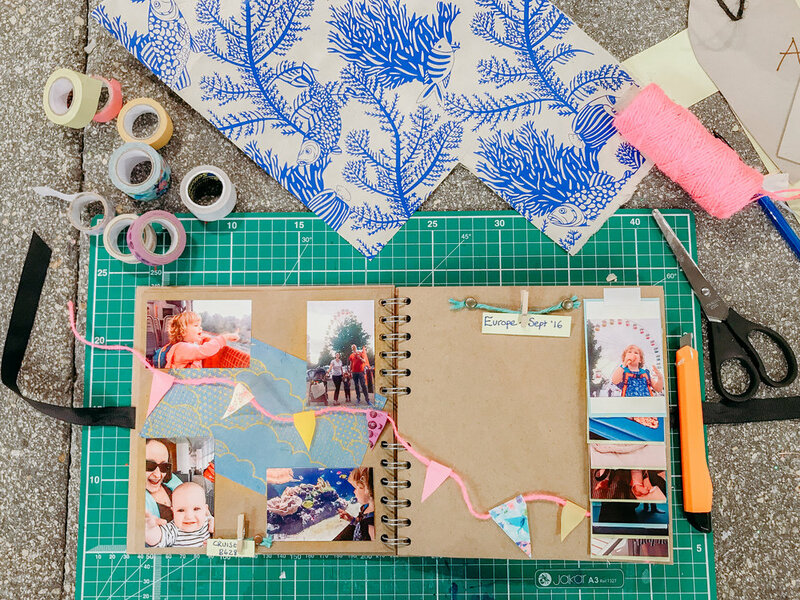 This was a brilliant introduction to Scrapbooking. My main reason for booking the class was so that for future travels I can involve our two girls and we can continue to create the scrapbook together. So thank you Paperchase (and Cameron) for a great introduction to Scrapbooking - I hope to be back soon. in the meantime here's a Pinterest board I've put together with Scrapbooking ideas.